Yes, this is true. Now all Indian Railways travellers and passengers having connecting tickets can claim for full refund of their second reservation in case they miss out the same in case of the late arrival of the first train. In a sheer quest to avoid any monetary loss meant for the passengers, Indian Railways has altered two of its existing rules from April 1st, 2019. This change is related to the missing of the trains and as per the changes been done by the department, travellers can now claim for the full refund of the train, in case they have connecting tickets and they miss one of them due to the late arrival of the first train. As per another rule that is been changed by the department, passengers have the facility now to change their boarding junction. This decision was been taken by the Railways authorities as lots of passengers have missed out their trains just because of the late arrival of the first train. 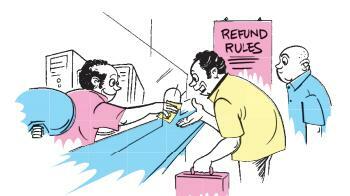 So, in such situations and scenarios from now on, passengers can get the full refund of the second ticket that is been provided filled with all the information in both the reservations. Aside from this, it is necessary for the first ticket’s arrival junction and the other ticket’s boarding junction to be the same. As per the new other law that is addressed to change the boarding junction, passengers now have the facility to change its boarding junction prior to the four hours of the train’s departure time that also leads to the fact that they can change the station name before the final chart gets prepared. Because, in case the final chart is prepared, it won’t be possible for them to take benefit of the new change. The new change is applicable to all who are having a booking under general quota category, even if they have the same under Tatkal quota. To change the boarding station name, passengers who have the e-ticket can make the changes by simply logging at the IRCTC site prior to the final chart getting prepared and those who have a counter ticket will need to reach to the nearest station and let the railway officials know about the origination point of their travel and make the respective changes. Those who cannot opt for any of the approach simply have to call on toll free number 139 and put on a request there to make changes for the boarding station over phone. Though, do make sure to even put forward this phone call before four hours that is the final chart preparation of that train’s departure time. Just for the information, the facility to do change the boarding station name is absolutely free of cost for all passengers and travellers.